As the sun set over Washington, DC, where Occupy DC was being threatened with dispersal by federal and local DC police forces, a small group of local DC area residents gathered outside the British Embassy and Chancery compound to support Julian Assange and oppose the course of injustice he is being forced on that may see his extradition to the United States which has been implicated in the Wikileaks revelation of American war crimes in Iraq amongst other countries around the world. 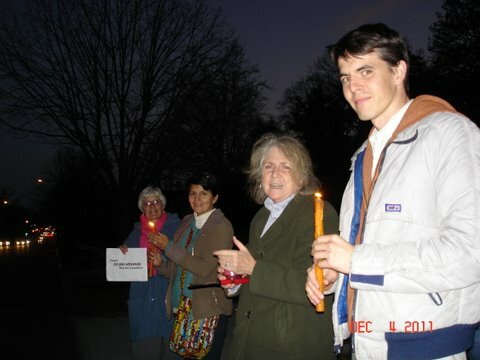 A small gathering by candlelight took place attended by local resident activists composed of the local Dorothy Day Catholic Worker community, Pax Christi USA, the National Campaign for Nonviolent Resistance, and others from around metropolitan Washington, DC. the US intelligence community. Local peace and social justice activists in the Washington, DC area are mindful of this as they also prepare for demonstrations of support for alleged US war crimes whistle blower, US Army Private Bradley Manning, who is scheduled for trial outside of Washington, DC this month.